I’d be shaking in my size 10s if I had to fill the sandals of Moses! I’m sure that in his humanness Joshua was intimidated too, but he was well trained because he had served under Moses for 40 years. I mean – he wasn’t exactly a spring chicken when God gave him His incredible I-made-you-for-greatness and I’ve-got-your-back motivational talk. After all, when we depend on God, we are depending on the faithful Protector, Provider, Defender, and Guide… who will never leave or forsake us. Read Isaiah 41:10. What two things does the Lord instruct us NOT to do in this verse? What four reasons does He give to explain why we shouldn’t do those two things? Why should this matter to you? What is one way you can apply this to your life today? Write a prayer response in your journal or swing over to my blogand write one in the comments section. 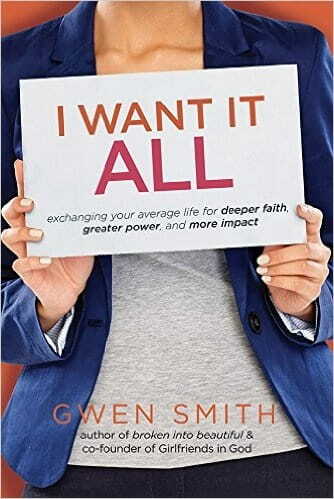 My next book, I Want It ALL, is now available for pre-order. Here’s the challenge: live beyond ordinary! You and I were born for greatness. Not for the world’s greatness, but for eternal greatness: to know God and showcase God. That’s the message of I Want It ALL. Pre-order yours today from Amazon, Barnes & Nobleor ChristianBook.com.